On a subsequent trip to India, Bhagawan again graciously granted me an interview. The hurt was fresh in my mind and I requested Swami to speak to me privately. He took me inside, made me sit and pinched my cheek and said, “You must speak on SAI experience and morality.” I said, “Swami, I don’t use any reading material and I tend to close my eyes as I speak about You.” He said, “Go ahead and speak and I will be there inside you.” And He said that with so much emphasis that I promised to Swami that I will forget everyone else and think of only Him while speaking. Then I asked what kind of service I should do. He asked me to teach the children, help the old and visit hospitals. So with Swami’s grace I have been a Balvikas teacher since 1981 and have tried to follow what He has asked me to do. Now I know I am just an instrument and His message is being given through me rather than by me. RS: How has this influenced your professional life? FM: During the period I came to Swami, I was studying to become an accountant and was working in an international firm called Pricewater House. As is the habit in this profession, all boys would go for drinks on Friday afternoons. But after I came to Swami the influence was so strong that I gave up eating meat and drinking alcohol. I used to be a joke for my colleagues! But I withstood all the peer pressure and never smoke or drank. But later they respected me and would say, “Fize doesn’t drink or smoke but he has such a good time.” At times when some of them used to over-drink and fall sick the next morning, I used to be of good help. Thats how I tried to practice Swami’s teachings in my professional life. One of Swami’s teachings is that “Politics without principles, education without character, science without humanity, business without morality is not only useless, but positively dangerous”. We have seen in very recent times how many Indian and international firms have collapsed by practicing business without morality. RS: In an accounting firm there is plenty of scope to practice Swami’s teaching of “Business with morality”. In fact the absence of morality in business is the cause for the entire economic crackdown and collapse that we are witnessing recently. Was it a big challenge to adhere to these principles in your professional life? FM: Definitely so. There were many people in my profession who were doing unrighteous things. When I was striving to do things in the right way, I was opposed by such people. It was very difficult. But I held firm to my beliefs and principles knowing very well that this is what Swami wanted. As Mahatma Gandhi said, “Truth in the minority of one is truth, untruth in the majority of millions is still untruth.” Now when I meet these former colleagues whose lives have changed for better, they tell me how they admired me for standing up to what was right. RS: So it took a while, but in the end truth always triumphs. FM:Yes, Swami has had an influence on my family as well. I come from a broken home – my father was an alcoholic and my brothers were drug addicts. There used to be fights at home off and on and it used to pain me a lot. After one of my trips back from India, I told my parents that I would live separately in a room built in the backyard of my home. I did this because meat used to be cooked at home and there was also alcohol. And there in my room I used to do my sadhana by chanting the Gayathri mantra, reading spiritual literature, and so on. But every time I would have a quarrel at home it used to hurt me. One day I prayed: “Swami, I will give myself to doing Your service but You must promise me to restore peace and unity in my family”. Lo and behold! Few days after that my elder brother who was a drug addict and had this long hair came to me with a pair of scissors and asked me to cut off his hair! And my eldest brother who was a chronic alcoholic told me that he had given up drinking. The most amazing thing was that my father too gave up alcohol and involved himself with an agency, the alcoholic anonymous, that helps people give up alcohol! I saw Swami’s work here. Slowly my family gravitated towards His teachings. We started having Satsang about Bhagawan at home! The miraculous effect of transformation that Swami causes overflowed from myself to my entire family and today my mother visited Prasanthi Nilayam for a third time and my brother is on his second trip. RS: These are wonderful examples of transformation in your family as well as amongst colleagues. Coming back to your involvement in the Sai organization, as the Spiritual Coordinator of Trinidad and Tobago, what are the various events in which you are engaged in this small 'Sai land', if I can call it so? FM: Swami once said to a devotee that “There is a little island in the Caribbean that is the jewel of my eye – that is Trinidad”! The population is very diverse – our forefathers came from India about 165 years ago. Half the population is African and the rest Indian. Among those of Indian descent, there are Muslims, Hindus, and Christians. We have about 52 Sai Baba centres and for an island of the size of Trinidad and Tobago, the activities are remarkable. With Swami’s guidance, amazing things happen in this island. There are two TV stations in the country which screen Swami’s work from the DVDs that we give them twice in a week (an hour on Sunday and Thursday). And one of this is National TV, which is seen in every home. We have many Indian radio stations, but on two of them there are one hour programs twice a week that disseminate the message of Bhagawan. RS: What kind of impact do these programs have there? FM: We have screened the project about the miracle school in Africa and also on the water projects. People now enquire about the organization. Some of them feel encouraged to contribute to the projects and join the organization. They appreciate the universality of the message of Bhagawan Sri Sathya Sai Baba. Interest has been generated as to who Sai Baba is and about His teachings and philosophy. We conduct medical camps in Trinidad’s remote villages on a regular basis. We do Grama Seva and just before coming for the 84th birthday celebrations, we identified 84 poor families to receive groceries, food hampers, and cooked food. We give scholarships to the poor. We clean beaches and visit prisons and hospitals. On the educational front, we conduct Bal Vikas and EHV classes. We have trained teachers who can go back to the school and disseminate EHV. We are currently working with Trinidad and Tobago’s education ministry to incorporate EHV into the educational curriculum. Every day there is bhajan going on in at least one of the Sai centres in Trinidad. We have excellent Bal Vikas teachers. So in Trinidad and Tobago, there is a great awareness about who Sathya Sai Baba is and about His work. RS: Can you tell us a little more about the EHV program? 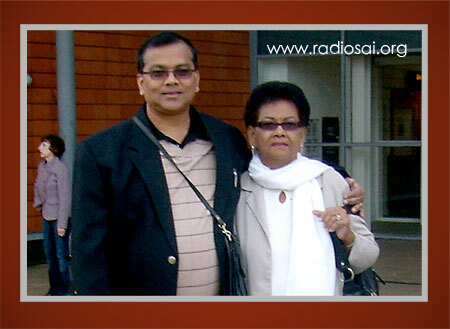 Because through this program Swami’s message has travelled to many countries in Latin America. What impact it has had on the children, parents, and the society at large? He has also said, “If there is a bad student, it is not so bad, but if there is a bad teacher, it will make generations of students bad.” So in Trinidad and Tobago we have an EHV Institute of the Caribbean. We have a central coordinator who coordinates the entire West Indies, which includes Trinidad and Tobago, Guyana, Barbados, Jamaica, and Curacao. In Curacao a presentation was done to the Ministry of Education. They were so impressed with the content and the effect, that they have adopted EHV for all the schools in Curacao. We are striving to do a similar adoption of EHV into the curriculum in other countries too. But once Swami told us that it was still not time. Even if EHV hasn’t been integrated into the curriculum formally, there are so many devotees of Bhagawan who teach the SSC classes throughout the country; they have already integrated EHV into the way in which they teach. Thus Swami’s teachings have started to take root in Trinidad and Tobago. RS: Please tell us about the activities in the spiritual front. FM: We have programs at the national, regional, and central levels. We have a national spiritual retreat for about three days at particular sites that involves the entire organization. The programs in this include nagarasankeertan, bhajans, study circles, video presentations, and so on. RS: What generally happens in the study circles? Are there people of all faiths? FM: The spiritual retreat is usually for devotees, but we have another program where we call the people of other faiths as well; its an ecumenical programme where we invite people of different faiths to talk to each other. RS: The reason I asked this is because Islam is a very profound religion that worships the formless and starts at the level of advaitha. Unfortunately it is misunderstood by large sections of population. Since you have such a beautiful and universal approach to God, we are keen to know if there are efforts to spread such understanding of the religion so that that way there can be more peace in the world. FM: This used to trouble me a bit when I initially visited the Sai centres. Bhajans used to be sung and there were only Hindu idols on the altar. It was a bit of conflict to me and I used to imagine how a Muslim or a Christian would feel if they come here. Bhagawan Himself has said: “Let the different faiths exist. Let the glory of God be sung in various ways.” Hence few of us got together and modified it to suit the diverse nature of our country and to reflect the universality of Swami’s message. If you ask someone in Trinidad who Sai Baba is, they would reply He is a Hindu. Therefore there is a need to modify the singing, the altar, the message and so on to convey the universality of Swami and His message. RS: I am reminded of a simple and sweet definition Swami gave of ISLAM – I Shall Love All Mankind! So what other spiritual activities are carried out in Trinidad and Tobago? FM: We have Gayathri mantra chanting, bhajans singing and training, and ecumenical sessions. We celebrate all the major festivals such as Makar Sankranti, Maha Sivarathri, Ester, Guru Pournima, Eid, Diwali, Swami’s birthday, and Christmas. In one of the festivals, we invited the Indian High Commissioner. He gave a talk and was very impressed at what he saw and commented that the universality that he experienced was the true work of Sai Baba. RS: You have been blessed to be a wonderful instrument in Swami’s hands and you speak so well. Do you sing too? We can end this conversation on a musical note! FM: Yes, I will sing an Islamic song, which I dedicate to my loving Mother Sai. It was locally composed in Trinidad. simply means that there is only one God and Prophet Mohammed is His messenger. Glory be to the God! RS: Thank you so much for being here with us today and sharing your wonderful experiences. FM:I thank Bhagawan for this opportunity. Sai Ram.